Do you deliver on the 35th of the month? "We deliver everything by the 35th of the month!" That's what I was told by a frustrated Finance Director. On time delivery is a challenge for many businesses, especially when the goal posts appear to move on a daily basis. But, what do you do if you recognise this problem within your own business? There are a number of strategies that you can employ to remedy this situation. 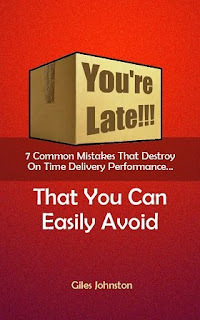 Seven of the most effective strategies are available in my free guide "You're Late!!! ", which you can download here. Triggering your internal business processes. How you start, and execute, your internal business processes can make all the difference to how your profits and on time delivery results can turn out. Tying the triggers to either an existing business habit or a specific time of day can make a big difference in this area. Are people following the processes? How you know that things are working properly is the other point I want to mention in this post. The feedback that you get, the frequency you receive it and the quality of the information is essential to affect the performance of your business. Decide what you need to know, how you want the information presented and how often. Just doing these two things will make the on time delivery performance of your business much easier to control. And, once you have mulled these ideas over download a free copy of my guide "You're Late!!!". We can't control everything in our working lives, but we can use tried and tested strategies to improve how the operations of our business works. Giles is also the author of Business Process Re-Engineering and creator of the 'Making It Happen' continuous improvement strategies course.